Alaskan fog shrouded the mountains the morning Martin Chalk’s helicopter transport sped toward the most remote hotel in North America. ￼His second thought: What are we going to eat up here? Feeding guests on a remote glacier would be a challenge under any circumstances. Feeding them at a level matching the chalet’s mortgage-size room rates—starting at $2,300 per person based on double occupancy—is a whole other game. The lodge is reachable only by helicopter or plane, so everything must be flown in, from table linens and firewood to champagne and bagels. 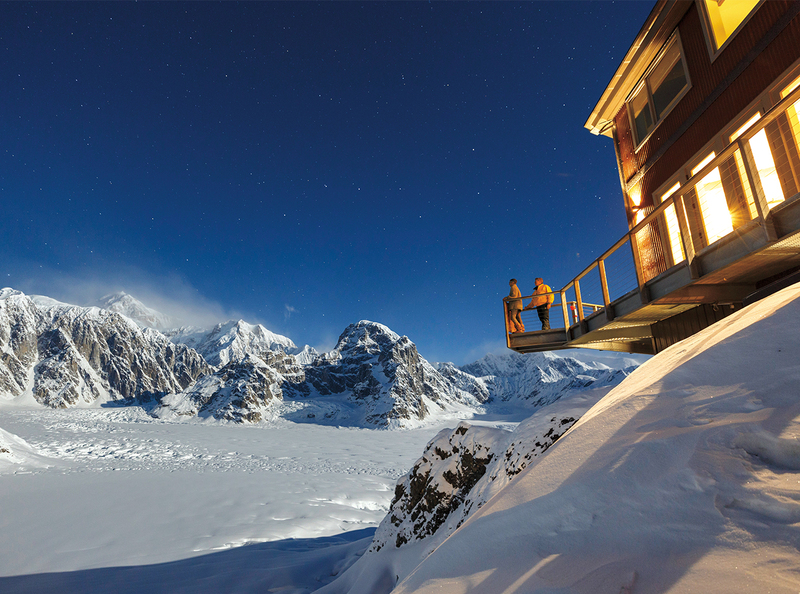 For Dave Thorne, the Anchorage-based chef whose job is to make sure the dining reflects the five-star surroundings, every trip up to the glacier requires packing a weekend’s worth of food and drink for the most luxurious camping trip in the world. His grocery list ranges from the most delicate foraged berries and Alaskan prawns to 50-gallon drums of fuel to cases of Denali Brewing beer. He loads what he can into a Beaver or Otter seaplane at the small airport in Talkeetna—the point of departure for most guests, as well. What can’t fit in the plane follows behind by helicopter, bundled in a cargo net that swings from below. “I’m up there on the helipad, the helicopter hovering over me, coming down with 500 pounds of stuff,” Thorne says. It sounds like a scene in an action movie, a rescue operation bringing desperately needed supplies to stranded hikers. One strong wind, one wrong move, and Thorne could be flattened by a crate of king crab legs and faux-fur animal pelts—which bothers him not at all. The property, which opened last February, is the brainchild of Marne Sheldon, her husband, Robert Sheldon, and his sister, Kate Sheldon. The family has a special connection to the place: The Sheldon Amphitheater is named for the siblings’ father, Don, a celebrated aviator and mountaineer who pioneered the technique of glacier landings. In 1966, Don built a small cabin, the Sheldon Mountain House, as a way station for mountaineers en route to the highest peak in North America, with a dream to make this part of Alaska a must-visit for serious adventurers. Sheldon Chalet, a two-minute walk away, is the next generation’s bid to continue their father’s legacy. 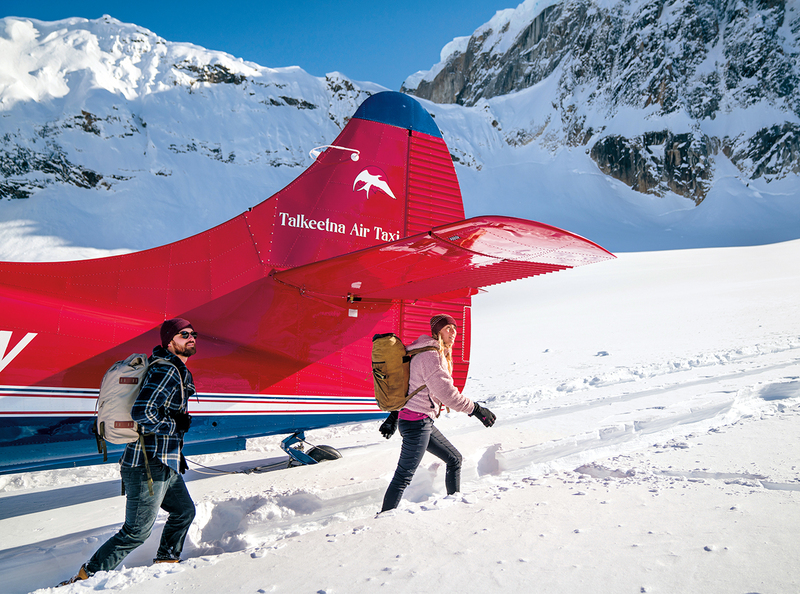 Guests enjoy glacier treks, ski touring, and helicopter tours, relaxing at day’s end with a fireplace, a cedar sauna—and uniquely Alaskan haute cuisine, courtesy of Thorne. Thorne grew up in Anchorage, the son of a transplanted Detroit native who spent as much time as possible in the outdoors. “When I was young, he’d tell me about a tiny cabin near the top of Denali, and the aurora borealis there,” Thorne says. But the ultraluxe chalet is a far cry from the rustic shack celebrated by Thorne’s dad. The two-story structure is hexagonal; wrapped in windows to maximize the otherworldly views of the mountains by day and, from September through April, the aurora borealis by night; and furnished with plush beds and spa-like bathrooms. Downstairs, Thorne directs the meals from an open gourmet kitchen, serving dishes such as local bison bresaola and seared Alaskan scallops with local broccoli and foraged clover-flower saute. A continental spread greets guests in the morning, with Thorne whipping up pancakes, omelets and anything else you might want to order. Lunch is out on the glacier: hot soup and crab cakes at a table carved from the snow. At dinner, Thorne goes all out with multicourse menus of pristine Alaskan ingredients: wild salmon and halibut, elk, bison, and surprisingly delicious vegetables. The 49th state has a longer growing season and a more established indie agriculture scene than you might think. Before joining the Sheldon Chalet, Thorne ran his own distribution company linking chefs and farmers; he now exploits those connections to bring the best products to the chalet. All food and drinks at the chalet are included in the nightly rate—massive but worth the price, Thorne says.